It regulates the volume of perspiration from the very first application without blocking the ability of your feet to breath and sweat normally. It's exclusive, patented myco-preventive USS Lipesters ® prevents mycosic infections and protects the skin from any irritation caused by excessive perspiration. The cream is easy to apply and neutralises bad odours very quickly. The allantoin complex normalises perspiration and prevents skin irritation caused by excess sweat, while the lichen extracts fight against the formation of unpleasant odours and help prevention of mycosis. The triclosan and menthol deodorises, disinfect and refreshes boots and shoes instantly, helps prevents bacterial development (mycosis) making shoes last longer. This is ideal for sports shoes, tennis shoes and safety shoes. 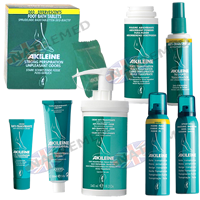 Akileine Powder spray for Shoes and Feet : Prevents dampness and overheating. Creates a protective film which avoids the overheating of feet through friction and irritation. It absorbs moisture, regulates perspiration, deodorises and refreshes thanks to its essential oils of lavender. Please note that aerosols are no longer shipped overseas due to new international laws. Therefore this item cannot be sent outside the UK. These Deodorising foot bath tables provide a refreshing and cleaning action for your tired, hot, sore and perspiring feet. dissolve 1 tablet in a foot bath, sit back and relax while the (active ingredients) Lipoaminoacid and essential oils clean, deodorise and relax these tired feet. Supplied in boxes of 7 tablets. It deodorises, disinfects and refreshes boots and shoes instantly.The triclosan helps prevents bacterial development (mycosis) making shoes last longer. 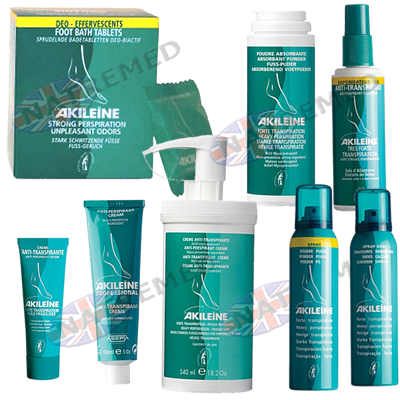 This is ideal for sports shoes, tennis shoes and safety boots and shoes. .
Akileine Powder Shaker Shoes and Feet : Akileine Powder Green can be used on either the feet or shoes and create a protective film which absorbs moisture, regulates perspiration and deodorises. It is infused with essential Lavender oil.